Canada has seen its free trade reach increase incrementally in the past three years: starting with Europe in 2017 and extending now to the pacific rim in 2018. This expanded reach comes with a lot of promise but also many pitfalls. Please find below specific information on how the deal will impact Canadian importers. The duty-free tariff will be applied automatically by your broker where appropriate confirmation of origin has been provided by your vendors. This statement MUST be either reproduced on the invoice or an additional document and signed by the seller. An example of the statement can be found at the end of this article, while our branded PDF version can be found here. 2. Does this free trade agreement cover all goods? No, as is the case with most free trade deals, exceptions abound: garments and textiles in particular are subject to a harsh ‘yarn-forward’ requirement, making it unlikely that apparel produced in Vietnam would qualify as duty-free. Agricultural goods are faced with similar issues. An sofa has its wooden frame manufactured in Japan and then is upholstered in Vietnam. Since both nations are qualifying, the end result will still quality. A light fixture is made in China, and then has a small Vietnamese flag applied in Vietnam before being exported to Canada. In this case, the real origin of the product would be better described as China since the amount of work done in Vietnam did not appropriately consume or transform said light fixture. Had the light fixture been installed in a large machine, then likely the machine would be considered eligible for duty-free status. ‘Yarn-forward’: This means that garments must be cut-and-sewn from fabric and yarn produced inside the transpacific territory in order to qualify. A lot of attention has surrounded Vietnam as a prominent exporter of garments, but given the restrictions of the yarn-forward rules it is unlikely such imports will qualify. 4. Who are the transpacific members? The TPP membership includes: Vietnam, Singapore, Brunei, Chile, Japan, Malaysia, Mexico, New Zealand, Peru, and Australia. 5. Why is the TPP not more of a big deal? 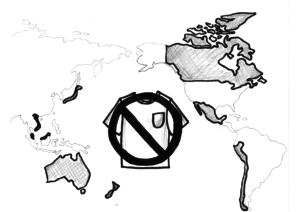 The vast majority of products entering Canada are already duty-free regardless of origin, and one of the major categories that remain dutiable (garments) are more or less excluded from duty-free eligibility as a result of strict transformation rules (yarn-forward). The real winners of the deal will include importers of household articles and appliances that are manufactured in the transpacific territory. 6. How can I know if the benefits of TPP were claimed on my imported goods? On the B3 document provided to you by your broker, check if the ‘tariff treatment’ box includes the digits 33. If so, the goods were imported as TPP-qualifying merchandise. Do you have additional questions about how TPP affects your business? Contact us! A certification of origin that is the basis for a claim for preferential tariff treatment under this Agreement shall include the following elements:1. Importer, Exporter or Producer Certification of OriginIndicate whether the certifier is the exporter, producer or importer in accordance with Article 3.20 (Claims for Preferential Treatment).